Kamen Rider Blade & Kamen Rider Chalice Return In Kamen Rider Zi-O! Once again some veteran Kamen Rider actors are returning for the anniversary series Kamen Rider Zi-O! The Time Riders will be visiting the era of Kamen Rider Blade! To cap off this new story arc, a pair of returning Riders confront Team Zi-O. *Takayuki Tsubaki once again reprises the role of Kazuma Kenzaki, Kamen Rider Blade! *Ryoji Morimoto makes a welcome return once again playing Hajime Aikawa, Kamen Rider Chalice! Definitely fantastic news for Kamen Rider fans! Feel free to join in our Ongoing Zi-O Discussion Thread to share your thoughts & fears about this remarkable series! News of Kamen Rider Converge’s next instalment have been making the rounds with several teaser images popped up recently. First up, we have what appears to be an image of Kamen Rider Kiva in early stages of development, in addition to that we have sketches for G3-X, Chalice, and finally Kuuga Ultimate form though weather or not these will share a case together is currently unknown. Due note that as that the source of these images is still being tracked down so for now take this posting with a grain of salt, but stay tuned and we’ll bring you more up to date information as it becomes avalaible. Click “Discuss on the TokuNation forums” at the bottom of this post to see all the updated displays. Timed perfectly with S.H.Figuarts Chalice going up for pre order last night, the Tamashi Web shop has now made pre orders available for the accompanying piece: the Shadow Chaser. S.H.Figuarts Shadow Chaser will be released in August for 4536 yen. S.H.Figuarts Chalice was announced just yesturday as a mass retail release. 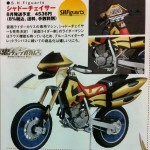 However, his bike: the Shadow Chaser is now confirmed to be a web exclusive via scans of the latest Figureoh Magazine. S.H.Figuarts Shadow Chaser will be released this August for 4536 yen. Tamashii’s main page has updated once again with some interesting future releases! 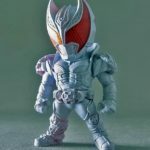 Highlights of the June release schedule are SH Figuarts Kamen Rider Chalice, the long-absent fan-favorite from “Kamen Rider Blade” and Ultra-ACT Ultraman Ginga, the newest supersized hero! Price details on both are not yet confirmed so stay tuned for further details! 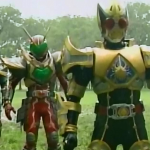 And now we take our final look at Kamen Rider Blade for Let’s Watch Wednesdays! he chose to seal Hajime and end the Battle Fight for good. 4 years later 3 new riders Glaive, Larc, and Lance have taken up the charge of fighting the Undead?! 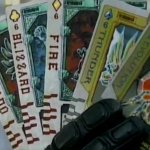 But if they were all sealed before, even Joker, then how can this be? A second Joker has appeared, the 4 Kings have created a new card, and ancient power is up for grabs. 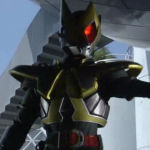 This is Kamen Rider Blade: Missing Ace! And there’s more! As an added bonus we’re also viewing the Hyper Battle Video for the series Blade VS. Blade! A Trial Series Undead will attempt to become Kenzaki, and the other riders will have to figure out which is which (it should be easy). This week is also your FINAL chance to post in these discussion threads and be entered for a chance to win S.H. 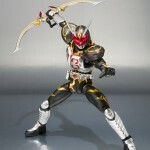 Figuarts Kamen Rider Blade or our secondary prize! Be sure to click “Discuss on the TokuNation Forums” to take you to the weekly discussion thread. Every post there gives you a chance to win and this is the final thread to do so! We’ll have a nominations thread for the next Let’s Watch Wednesdays segment this week as well. And we’re back with our regularly scheduled programming on Let’s Watch Wednesdays! But this is the home stretch for Kamen Rider Blade. With only 4 episodes and a movie left we’ll mix up the end of this segment. This week will be the final 4 episodes, 46-49. Then next week to end it all we’ll be viewing the Blade Movie, Missing Ace! If Joker wins the Battle Fight the world ends. But Tenonji will use a Trump Card in this fight, The Fifth Ace Kerberos. The one Undead created by man, not the Master. Between Tennouji and the final Category King controlling it’s power, the Battle Fight will be brought to an end. But humans can only survive if the riders win, and if they do Hajime must be sealed too. Garren will make the impossible choice to save a life, a winner will be declared, the Dark Roach will be born, and the end of the Battle Fight will be turned on it’s head. As long as two Undead exist the battle never ends. Kenzaki will make the ultimate sacrifice, for the eternal stalemate. Don’t forget that this week and next will be your final chances to be entered in our Let’s Watch Wednesdays giveaway! Every post you make in our LWW Discussion threads will automatically enter you in for a chance to win S.H. 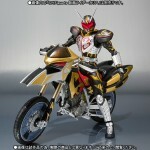 Figuarts Kamen Rider Blade, or our to be revealed secondary prize! The poll for the next LWW series will be in 2 weeks so get your nominations ready! Let’s Watch Wednesdays is back at Tokunation for the new year! It’s time for one last Thursday edition with Kamen Rider Blade before we pick back up for your regularly scheduled programming next week! In a failed attempt at King Form Mutsuki unsealed his Category Ace. But the kind spirit of Shima saved him allowing him to use Shima’s category King power. With Blade’s King Rouzer in hand, the Spider Ace is at last pure, the true Leangle is born! But that won’t stop Tenounji’s brainwashed Undead from seeding chaos among the riders. Leangle has his power, but does he have the determination to use it now? 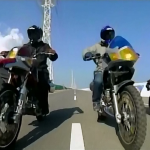 Can the riders draw out their real enemy? Can they end the Battle Fight? Be sure to take a look at and post in our weekly Let’s Watch discussion thread by clicking “Discuss on the TokuNation Forums”. Every post enters you in to possibly win an S.H. Figuarts Kamen Rider Blade or even a secret secondary prize! We’re near the end of our time with Kamen Rider Blade, and soon enough it’ll be time to choose our new show! After a short break for the Christmas holiday, Let’s Watch Wednesdays @ Tokunation is back! On Thursday! Remember that next week we’ll also be doing a Thursday Edition due to the New Years holiday. But for now, what terrible secrets lie hidden for Kamen Rider Blade? The terrible truth of Kenzaki’s King Form revealed! The secret of Dr. Hirose & the Trials uncovered. To discover the secret of Eternal life another Joker will be forced into existence. The longer he fights as a Kamen Rider the closer Kenzaki will be to becoming that monster. But if Hajime could evolve past the chaos of Joker surely Kenzaki can, right? And what greater power is at work in the dealings of the Trials? What power does the Stone of Sealing contain? Most important of all, will Leangle ever be free of the Spider? All times are GMT -4. The time now is 8:21 PM.